Are you housebound or do you know anybody who is? Eye Deal Optical are able to do your eye test at home for you and have been home visiting since 2007. If you are unable to get to us unassisted and are entitled to an NHS eye test this can be done free of charge. We cover the whole of Teesside and surrounding areas in the North East of England. We carry a wide range of glasses frames with us so you can choose your new glasses in the comfort of your own home. We can dispense any type of spectacle lens including Bifocal and Varifocal lenses. Once you have chosen your new frames we will return with your new glasses and fit them for you once they have been made. We also provide a full aftercare service which is included in the price of your new glasses. 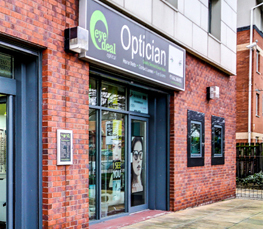 Eye Deal Optical can also cater for Nursing Homes and Sheltered Accommodation.